I ordered the quilted Chickering cover for the piano at my church. We are thrilled. The cover is excellent quality and construction. The price was very good. Your service was excellent. Thank you for doing business in an efficient and fair way. Will recommend you to others. I am very pleased with the look, fit, material, quickness of manufacture and shipping! It does everything that is needed and the process of ordering was easy! The requested logo was a perfect addition and came out centered and well-planned! This cover was made exactly to spec to fit our grand piano. Its thick, durable and well made to prevent kitty scratches but also lends a rich beauty to the living room. Thank you! 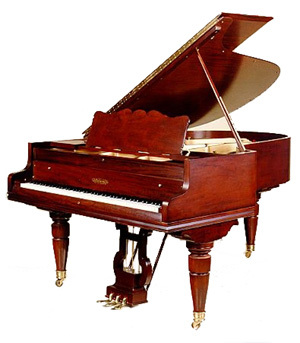 The piano cover for our 5'4" Chickering is a perfect weight and perfect fit. The order arrived promptly, and the process was simple. 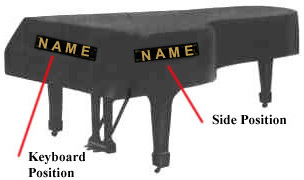 Piano Showcase is always so helpful in making sure we get the right products for our pianos. This cover fit like a charm.